The huge development of computer technology has been seen in the past 20 years, and sometimes you feel that the latest achievements are out of date. Computers have become smaller, lighter and more powerful. The scale of hard disk is bigger and the life expectancy is longer than any other time. Today, the only thing that hasn’t changed is how computers connect to the Internet. When we choose between Wi-Fi and Ethernet, we often get confused. Wi-Fi standards such as 802.11ac and 802.11n provide maximum speed of 866.7 Mb / s and 150 Mb / s respectively. But it is hard for you to realize that a large part of this bandwidth because it is also used by our Wi-Fi router for other purposes. Similarly, there are standards for Ethernet cables, such as CAT5, CAT5e, CAT6 cables, etc., all of them belong to patch cables. In theory, if you have CAT6 cable, wired Ethernet connection can provide up to 10 Gb / s rate. If you are a gamer, you must know how annoying delays are in online games. Moreover, it is obvious that Ethernet provides the advantage of lower latency in the war between Wi-Fi and Ethernet. Because when the Wi-Fi connection is sent around your home, your router uses radio waves. The strength and consistency of these radio waves can be reduced by obstructions in your home, interference from other devices, and the distance between your router and the connected device. These issues can cause the latency. The most disadvantage of Wi-Fi is interference. As technology takes over the world, we have wireless interference in our homes, including Wi-Fi routers, TVs, ovens, smart phones, game consoles, etc. These interference will not keep your Wi-Fi signal from other signals that affect your Wi-Fi. However, Ethernet cables have no such effect. Intruding Wi-Fi networks is easier to access than having an access to physical cables. Data on Ethernet can only be physically accessed to device access to the network. These devices, including laptops at one end and routers at the other end, need be protected by firewalls. With Wi-Fi, the data is in the air. If you are using an open network, all the data you send and receive can be intercepted, including personal information and login details. Finally, Ethernet provides better speed, lower latency and more reliable security. Wi-Fi provides convenient advantages and it is sufficient for most purposes. Therefore, you just need to see if your device is suitable for the type that Ethernet will affect it, and then decide whether it will produce enough differences to run some cables. 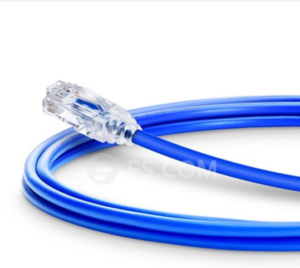 FS.COM can provide you with many kinds of Ethernet cables, such as Cat5e Patch Cables, Cat6 Patch Cables, Cat6a Patch Cables and so on. Contact us if you have any problem about this. This entry was posted in Optical & Copper Network and tagged cat5e cable, Ethernet Cable vs Wi-Fi, patch cable on August 1, 2018 by Admin.